There are times when we are not able to drive our own pets or perhaps there are pet owners who are non-drivers. It is advisable to build up a list of services that will either drive our pets to their destination or provide a courier service as part of their business. If you are moving overseas or indeed sending puppies that you have bred to their new homes in other countries there are shipping agencies that specialise in delivering our pets to their destinations. They will work with you to complete all documentation and ensure a smooth passage for the animal. The listings for these companies can be found in canine and pet publications. These companies will have special vehicles and trained animal handlers that will take care of your family pet and deliver it safely to its destination. If you need to use a taxi make sure the company knows that you will have a pet with you. 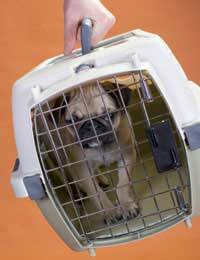 If it is a cat or small animal put it into a carrier, cage or box. For larger animals and dogs take with you a blanket to place on the seat before allowing the animal into the vehicle. When a pet needs veterinary help most vets will have a call out service; this of course will cost more money than the normal appointment would do so if possible try to get your pet to the surgery yourself. A new service becoming very popular is the private pet ambulance and taxi service. This is ideal if you do not have a neighbour or family member that is available to transport your pet. Some kennels and catteries have a collection and delivery service, which is ideal for families who are busy packing before a holiday or are without their car. Enquire about this service when booking in your pets. Sadly there comes a time when we lose our pets and we have to make the decision of how to dispose of the animals remains. If a pet dies at the veterinary surgery then they can offer to arrange a cremation. However, it is a little known fact that we can arrange this service ourselves. We can take our pet to a pet crematorium where our beloved animals are treated with dignity and respect and can wait to collect their ashes. However it may be that you do not have the use of a car in which case contact the crematorium and they will collect your pet as part of their service. No one likes to think of making these arrangements so it is Always a good idea to research which pet crematorium you would use, find out their details and hours of opening before filing the information for hopefully a long time in the future. Please note that our pets cannot be disposed of in crematoriums designed for human use. Whenever you are with your pet make sure you are carrying a mobile telephone. Programme all the telephone numbers that would be needed for your pet in case of emergency. If you happen to be travelling to a different area research any phone numbers that would be needed such as a vet or courier service.